Pentel Paint Markers have a 4.0 mm bullet tip that creates a 2.0 mm medium line. The opaque, pigmented, oil-based ink produces bright and vivid colors on metal, glass, ceramic, wood, rubber, and more. 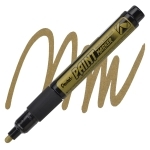 The permanent, quick-drying ink resists water, abrasions, and fading.